The 2019 Financing for Sustainable Development report from the Inter-Agency Task Force (IATF) on Financing for Development was launched today. For those – like me – who worry that the world is sleepwalking into another crisis, it's not reassuring. It confirms that global debt is at record levels and 'financial fragilities' have built up across the globe. It's also disappointingly light on solutions that could reverse these trends. What is the IATF report? The IATF is a group of fifty major international institutions that work on finance issues, including various United Nations bodies, the International Monetary Fund, World Bank and World Trade Organization. This report is its annual stocktake on progress towards meeting commitments to finance the Sustainable Development Goals (SDGs). It's an impressive undertaking, covering all major financing sources, with a mandate to look at the global financial and economic system as a whole. First, both public and private debt continue to grow in all country categories. 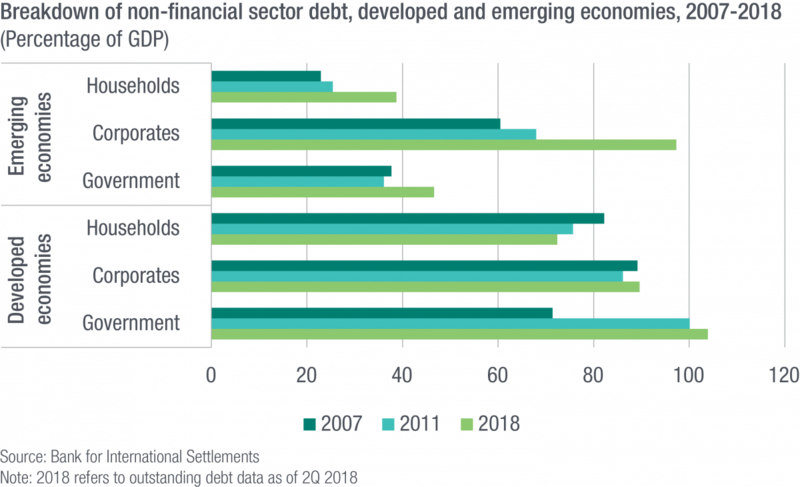 As the graph shows, emerging economies should be particularly worried about corporate debt, which is close to 100% of GDP. This high level of debt makes these economies highly vulnerable – changes in the internal or external environment could trigger bankruptcies that could lead to a full-blown financial crisis. Meanwhile, more than a decade after the global crisis, developed countries continue to have record levels of government debt. Clearly public finances in this group would be badly placed to weather any future crisis. Second, global financial sector risks are very worrying. The graph shows how the financial sector has 'deepened' – grown relative to the size of the economy – in all categories of countries since the turn of century. This can be a good thing for developing countries, but it depends on the way that the financial sector has developed. The report highlights that developing countries' financial sectors have internationalised, with international banks now making up 40% of their banking sector – a share which has doubled since mid-1990s. In other words, it wouldn't take much to precipitate a crash. Add to this the fact that three quarters of countries are found not to have a financial sector strategy, and it's beginning to look like a warning cry. Third, as might be expected from a report that is essentially a compromise between the differing perspectives of a wide range of institutions, recommendations on what to do to prevent another major crisis hitting the global economy are thin on the ground. One key area I've highlighted before is what to do about the increasing risk of a widespread public or 'sovereign' debt crisis. The report devotes a chapter to debt, and does mention some potential solutions. It has a section on the idea of making debt contracts dependent upon the ability of the debtor government to pay – known in the trade as 'state contingent debt instruments.' The idea of reducing the repayment burden when, for example, states face recessions or natural catastrophes is a good one, as a recent ODI report explores. However, on the central issue of how to rapidly and fairly resolve debt crises that do occur – to prevent the lost years (and often decades) that can result – the report is spectacularly unambitious, saying only that it might be time to revisit this issue. Perhaps I am expecting too much of a report produced by major international bureaucracies: the internal wrangling over each issue is likely to stymie creative, solution-oriented thinking. The time is therefore ripe for others to pick up this baton and produce the companion set of solutions to help prevent or resolve the problems highlighted by the report, and ensure that the world can meet the ambition of the SDGs without suffering another major crisis. Jesse Griffiths is Head of Programme at ODI and a specialist in development finance and the international development finance architecture. He has done work for a range of national governments, international organisations, non–governmental organisations and think–tanks, and has published widely on these topics.